I had a Lab growing up and he was my constant companion, best friend, and favorite snuggle buddy all wrapped into one. He was sweet, playful, even tempered, and a real loving guy. He was my best friend for many years; although it’s been 10 years since he passes I still miss him dearly. Labs will always have a special place in my heart, one stole mine from the moment he entered my life (even though he peed on me on our very first trip home). Update – All of the lovely Labs have been adopted. 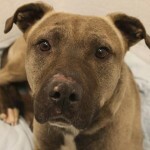 If you’re looking for a new best friend start your search on petfinder.com. Everyone loves Labs. They’re athletic, intelligent, playful, and have a sweet disposition that can melt anyone’s heart. Since 1991 they’ve been the most popular breed of dog registered in the United States, Canada, Australia, New Zealand, and the United Kingdom. Of course with such popularity a large amount of Labs end up homeless each year. Whether it’s due to financial hardship, allergies, or moving, shelters have heard it all. At no fault of their own these Labs have ended up in shelters. 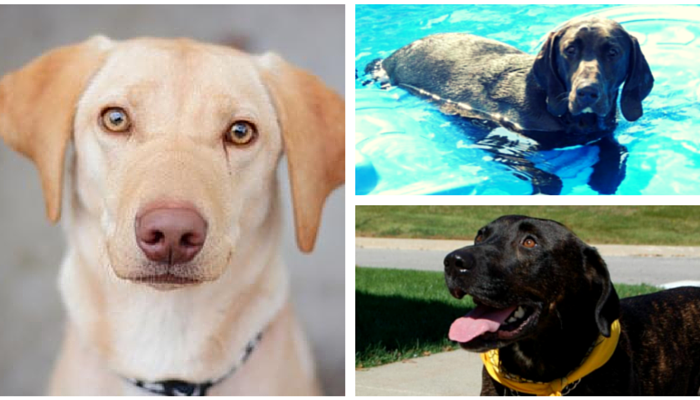 This week we’re featuring 10 lovely adoptable Labs and Lab mixes currently waiting for their second chance. They’re all adoptable in southeastern Michigan shelters and rescue organizations. If you’re looking to add another four legged friend to your family it’s hard to go wrong with a sweet Lab. They take the phrase man’s best friend seriously – you can’t find a more loyal and loving best friend than a devoted Lab. 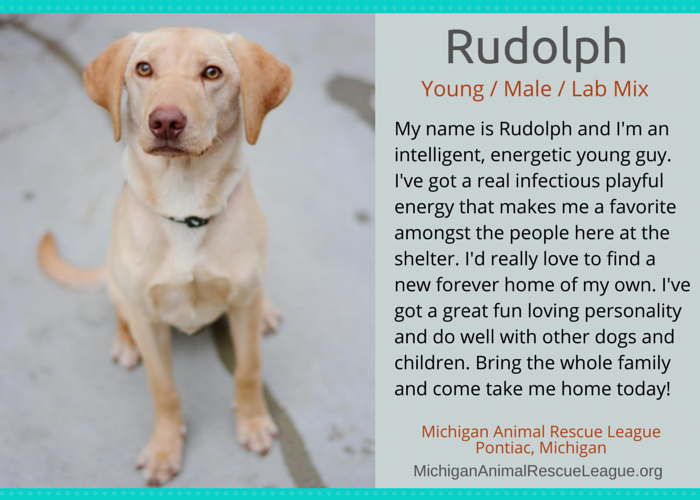 Rudolph is a young Lab available for adoption from the Michigan Animal Rescue League in Pontiac, Michigan. Rudolph is a happy go lucky kind of guy. He’s intelligent, enthusiastic, playful, and a real people pleaser. He’s always the first to come up and greet you with a wagging tail and big kiss. He does well with other dogs and children. He’d make a great addition to a fun, active family. AJ is a Lab mix available for adoption from the Michigan Animal Rescue League in Pontiac, Michigan. 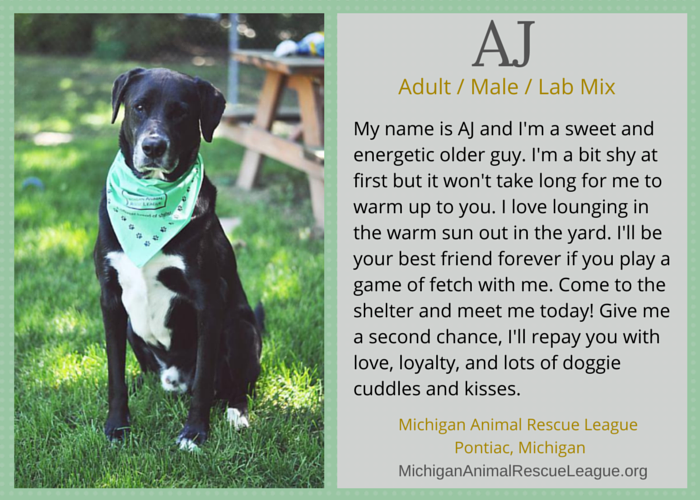 AJ is a sweet and energetic older Lab mix. He came into the shelter as a stray so not too much is known about his history. He’s a bit shy at first when meeting new people, but it won’t take long for him to warm up to you. He loves laying out in the sun and he’ll be your best friend if you play fetch with him. 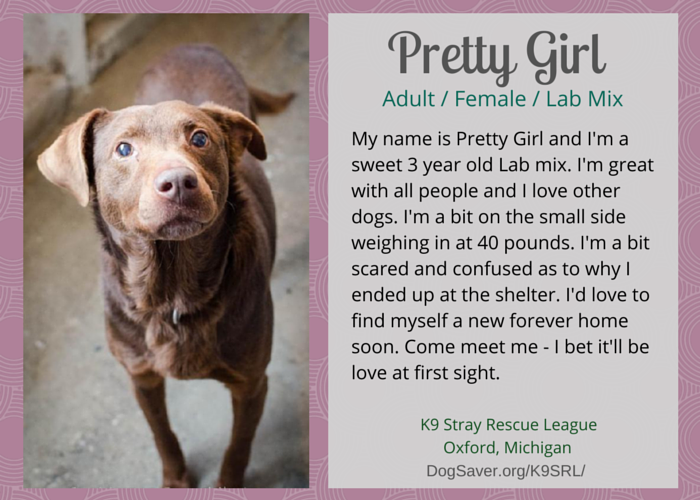 Pretty Girl is a 3 year old Lab mix available for adoption from the K9 Stray Rescue League in Metamora, Michigan. Pretty Girl is a lovely 3 year old Lab mix. She’s a bit smaller than most Lab mixes weighing in at 40 pounds. She’s confused as to why she’s ended up at the shelter and would love to find a new home soon. She connects strongly to people and loves playing with other dogs. Sergei is a 2 year old male Lab mix available for adoption from Waggin Tails Dog Rescue in Northville, Michigan. 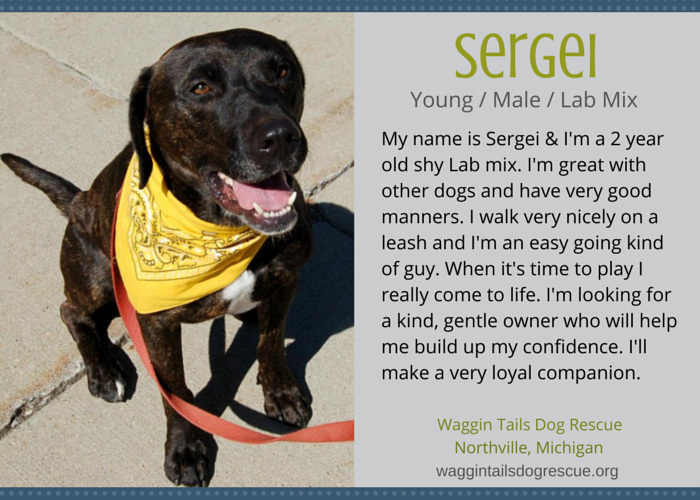 Sergei is a young, shy Lab mix that was taken into the shelter as a stray. He takes a little while to warm up to people but once he does he becomes very bonded. He loves other dogs and is looking for a patient, gentle owner who can help him build up his confidence. 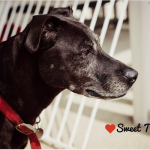 Tucker is a 5 year old Lab mix available for adoption from the Top Dog Rescue Group in Troy, Michigan. 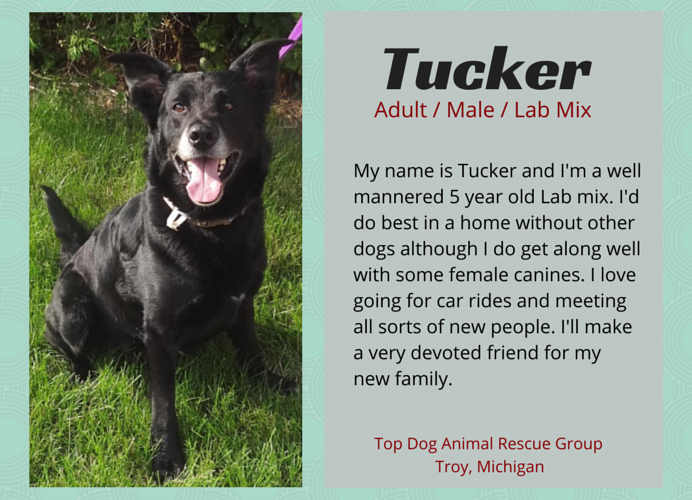 Tucker is a 5 year old Lab/Shepherd with great manners. He’s a sweet guy who loves being around his people and playing in the yard. He should go to a home with a female dog only or be the only dog in the home. He loves car rids and absolutely adores meeting lots of new people wherever he goes. 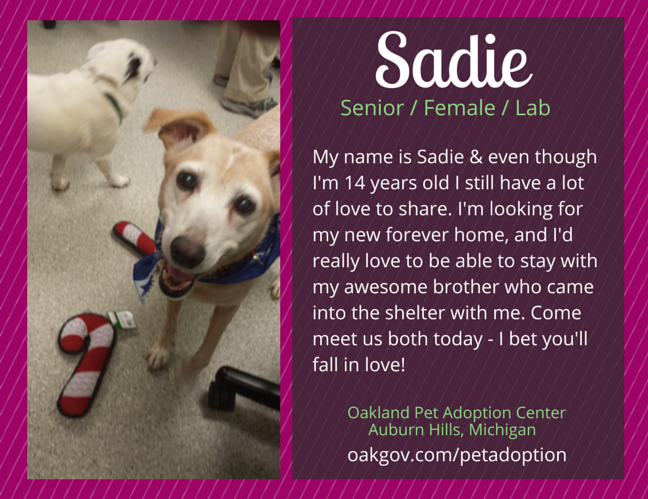 Sadie has a couple strikes against when it comes to ‘adoptability.’ Because she’s a senior and she’s part of a bonded pair her chances of finding a home will be challenging. 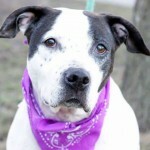 She came into the shelter with her senior brother Dozer and it would be so amazing if they could find a home together. Us dog lovers know that seniors make great companions – help spread the word about this lovely pair. I know the right home is out there for them. Dozer and Sadie were brought into the shelter together. They’re a senior bonded pair and the shelter would like them to be adopted together. 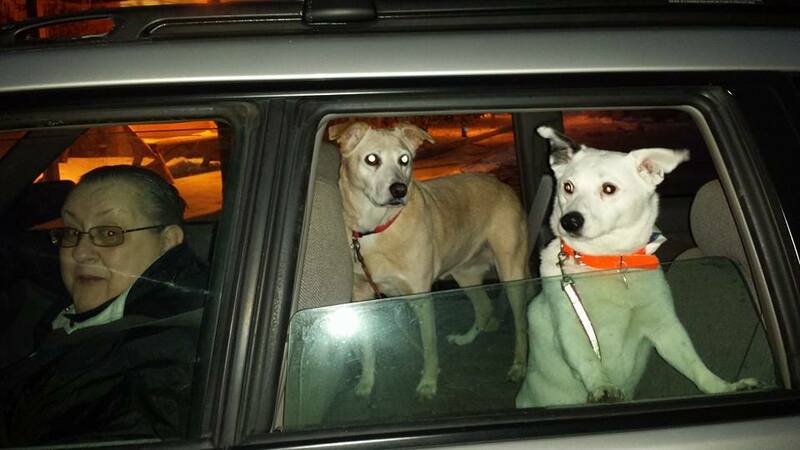 *Sadie is part of a bonded pair. 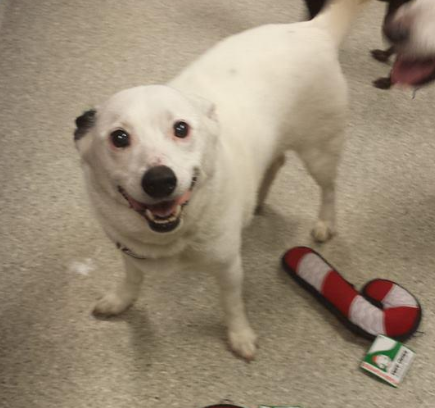 She came in with her brother Dozer, an 11 year old male Jack Russel mix and the shelter would love to find them a home together. Saide and Dozer were adopted together on 02/07/15. Jayme is a young female Lab mix available for adoption from Last Day Dog Rescue in Troy, Michigan. 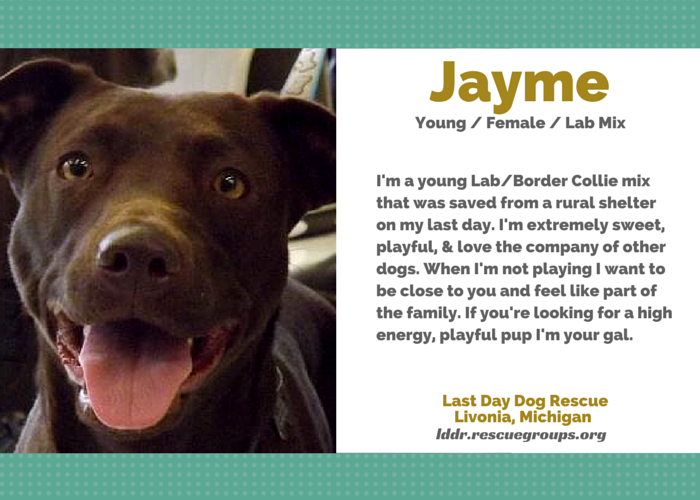 Jayme is a young Lab/Border Collie mix that loves to play. She gets along well with other dogs and loves to follow everyone around to be part of the action. She’d make a great companion for someone looking for a high energy, playful, and fun loving dog. Jager is a big lovable Lab mix available for adoption from Heavenly Paws of Michigan in Rochester Hills, MI. Jager is big guy weighing in at 120 pounds. He’s very loving and well mannered. He loves being around children and other dogs. He has a thyroid condition so he’s takes daily medication. 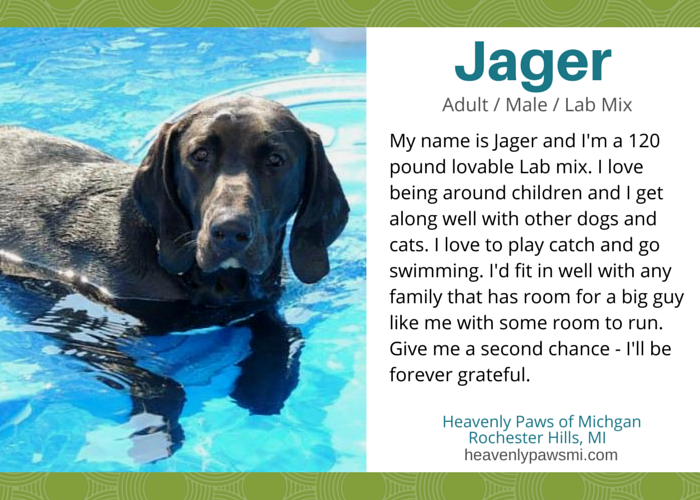 If you’ve got some extra room for a big, lovable dog Jager is the guy for you. 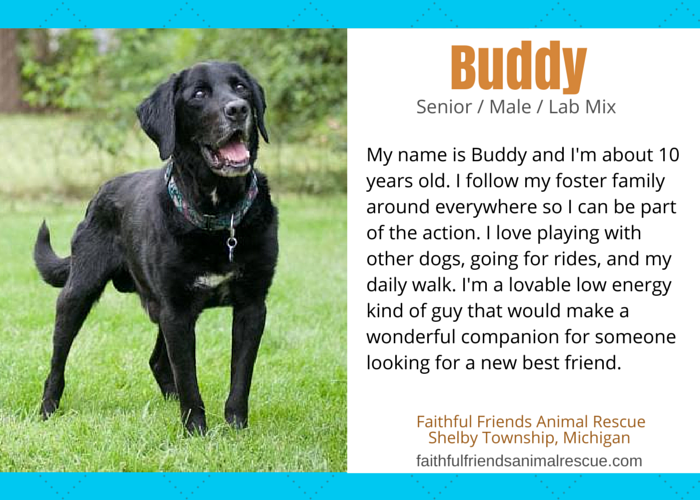 Buddy is a senior Lab mix available for adoption from Faithful Friends Animal Rescue in Shelby Township, MI. Buddy is a 10 year old guy that was rescued from a rural shelter after 5 months. He’s doing well in his foster home; he loves following around his foster mom and being part of a family. He loves going for rides, playing with other dogs, and taking his daily walk. Buddy would make a great companion for a retired couple or someone looking for a nice mellow companion. 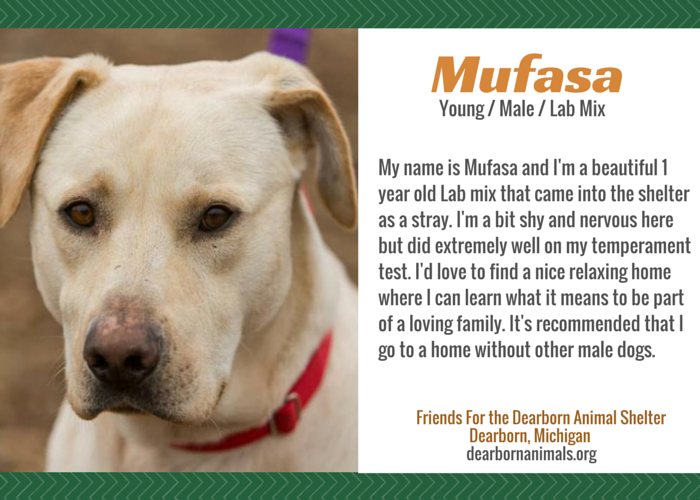 Mufasa is a 1 year old Lab mix available for adoption from the Friends for the Dearborn Animal Shelter in Dearborn, Michigan. Mufasa is a 1 year old Lab mix that came into the shelter as a stray. He’s nervous and shy at the shelter but did extremely well on his temperament testing. It’s recommended that he find a home without other male dogs. He’s a beautiful young guy that’s looking for a second chance. He’s looking for someone to show him what it’s like to be part of a loving family. 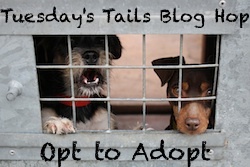 This post is part of the Tuesday’s Tails Blog Hop hosted by Talking Dogs and Dogs N Pawz. 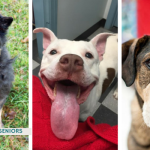 Each week we featured adoptable shelter animals waiting for their second chance. Join in or help by spreading the word about these awesome pets. We can’t do everything, but we can each do something. Together we can help find these guys new loving homes. I just adopted my first lab puppy. It seems like she is growing everyday. I can’t wait to see the type of dog she’ll be when she grows up. It’s a good thing I don’t live anywhere near Michigan. That’s so funny because when I was drafting this post I thought “Uh oh – I don’t know if I want Slim Doggy to see all these awesome Labs” lol. We are partial to Labs here at our house! Keeping paws crossed in hopes that all of these find a forever home soon. Sharing. Thanks so much. Labs will always hold a special place for me – they’re such amazing dogs. All just beautiful and as my Rudy can attest, I’m a sucker for Labs. Shared. I have never lived with a lab but I have spent plenty of time with them around the shelter and at friend’s houses. They are usually such happy dogs and quickly adopted. I hope these ten find homes soon. Aww they are all gorgeous! Labs do make wonderful pets! Sharing! I haven’t met a “bad” Lab either. I read in the paper occasionally about a Lab bite and I always look twice to make sure I read it right. I know it can happen, but for the most part they seem extremely tolerant and even tempered. Hope they find homes. One of those rescues is not far from me and I have never heard of it nor crossed paths with them. I have the softest spot in my heart for labs. I keep saying, I’d like a Springer or maybe a Greyhound” but I know my next dog will be a lab.